Electronic cigarettes or e cigs, e-cigarettes and personal vaporizers as they are also known as, heat e-liquid and allow the user to inhale liquid vapors. Unlike traditional cigarettes, electronic cigarettes do not contain any tobacco, carcinogens, or 1000’s of other harmful ingredients. Therefore, electronic cigarettes offer an alternative to harmful smoking! Smooth Vaporz proudly stocks electronic cigarettes from the industry’s premier brands such as Aspire, Joyetech, and Kanger Tech, as well as others. These great products can be found at any of our stores located in Waterbury, Torrington, Bristol, Winsted, or Seymour, Connecticut. E-juice or E-liquid is what your electronic cigarette heats to produce vapor. E-liquid is a water based substance with primary ingredients that include Propylene Glycol (PG), Vegetable Glycerine (VG), flavoring, and if the customer desires - nicotine. Smooth Vaporz offers the highest quality e - liquid, all manufactured in laboratory style locations that adhere to the highest level of cleanliness and quality in the industry and are made with the finest ingredients available. We currently offer over 130 E-liquid flavors and they are all available to taste at our tasting bar prior to purchase! The atomizer, or “coil”as it is commonly referenced to, is what turns E-liquid into vapor. The process is rather simple: there is cotton inside the coil, and the cotton absorbs the E-liquid. The battery then heats the cotton, which contains the e-liquid, and the heat produces the vapor. 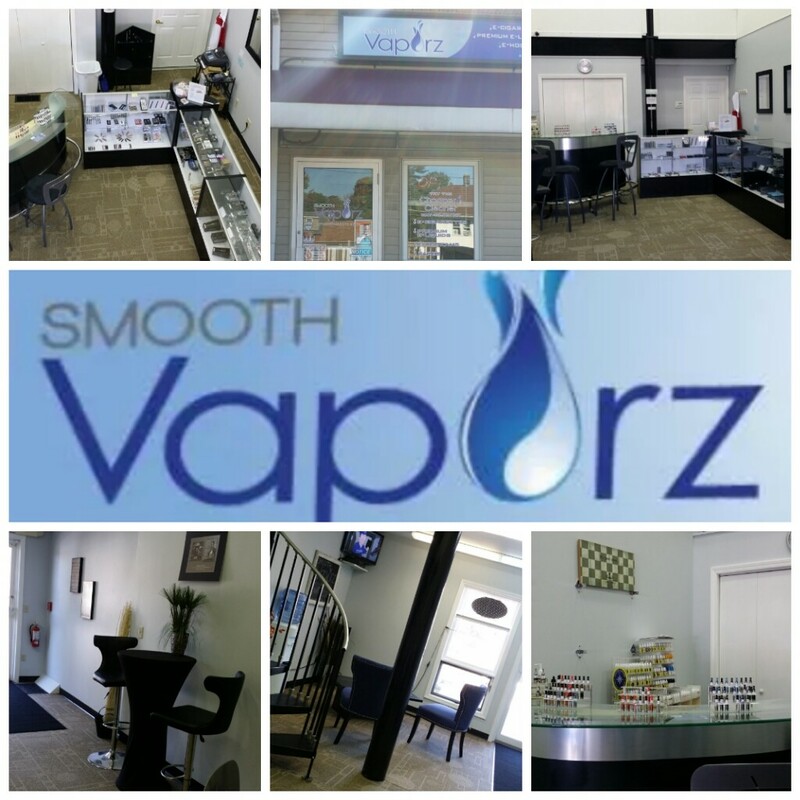 All Smooth Vaporz locations carry a large variety and selection of coils for the most popular brands in the industry. 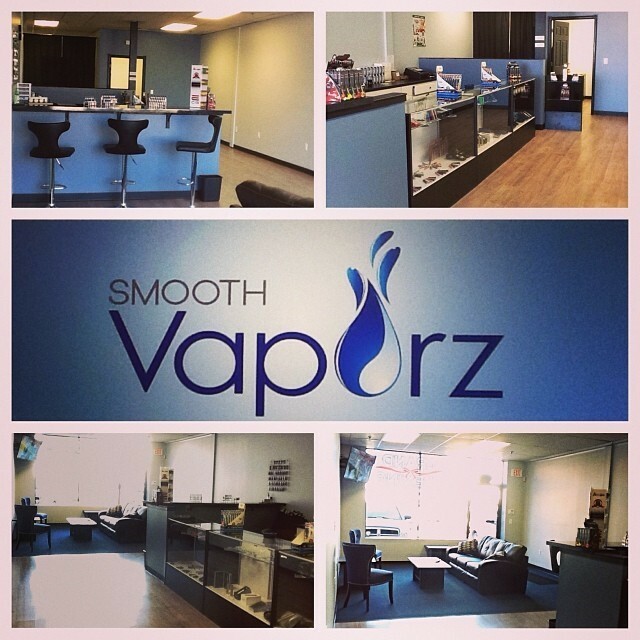 What makes Smooth Vaporz different from other vapor shops in Connecticut? We at Smooth Vaporz make it our mission to provide great products, but above all, great customer service to both the beginner and the most advanced vapor. We take time to gather information from each customer, and provide to them the product that best satisfies their individual needs. We are happy to show and explain to new vapors the wonderful world of vaping! 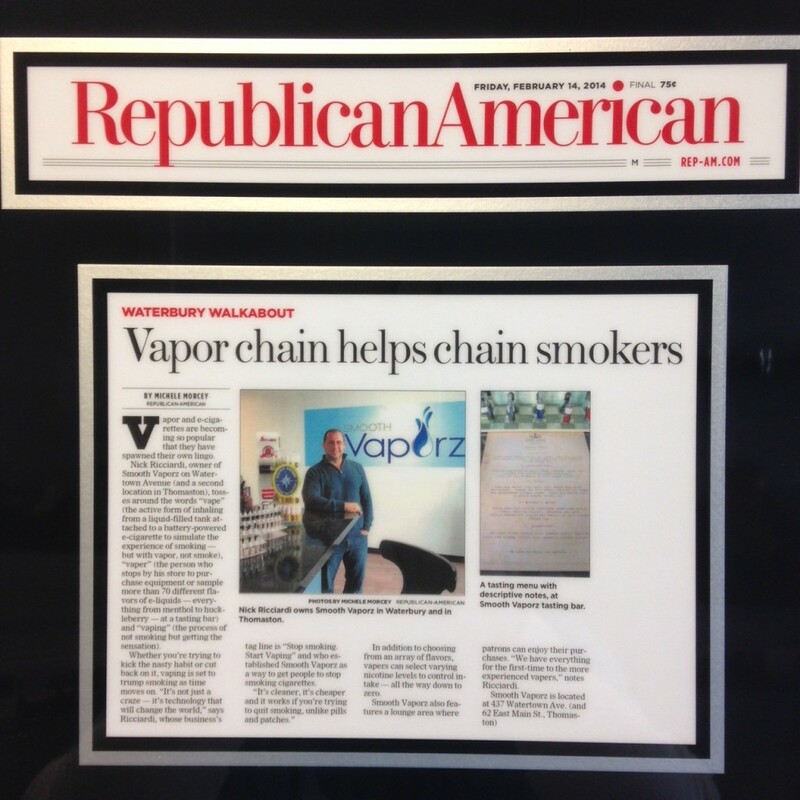 Our goal is to assist new vapors in achieving their desired results and enjoy being part of the movement of vaping that is sweeping the country and the world! How long should e-juice last? The amount of time each bottle of E-liquid lasts depends on each individuals use, but a 15 mL bottle contains the equivalent amount of puffs as a CARTON of traditional cigarettes does!! This is incredible being that a 15mL bottle of Smooth Vaporz E-liquid only costs $9.99!! A smoker that switches to vaping can save $1,000s a year!! Once an individual purchases an electronic cigarette and begins vaping the savings really start. As mentioned above, a 15 mL bottle of Smooth Vaporz E-liquid is the equivalent of a carton, that’s right, a carton of puffs on traditional cigarettes!! Imagine not having to buy cigarettes on a daily or weekly basis, and keeping that money in your bank account. The more you smoke - the more you can save. What product do you recommend I buy, to get started on vaping? 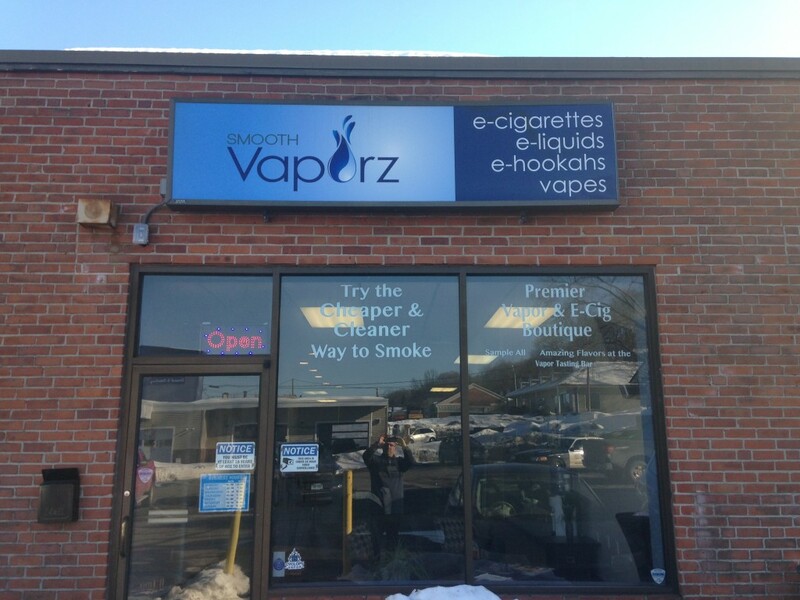 Smooth Vaporz / Mist Essentials offers numerous options in any of its stores located in Waterbury, Torrington, Bristol, Winsted, or Seymour. We offer starter and premium kits that are perfect for the novice vapor who is looking for a great product to assist in the transition from smoking to vaping. What is the best e-cigarette on the market? This is a matter of opinion, but all Smooth Vaporz carry the premier brands of electronic cigarettes in the industry. Stop in and see any of our team members for your consultation and we can recommend what products work best for you and your vaping goals. The best way to start vaping is to visit any Mist Essentials/Smooth Vaporz located in Waterbury, Torrington, Bristol, Winsted, or Seymour, Connecticut for your free consultation. We will talk with you and determine what products are best suited to your individual needs to get you to start vaping. You can also try any of the over 130 flavors of E-liquid we carry at our tasting bar. This ensures you find a flavor you like prior to your purchase. We will then set everything up for you so you are a happy vapor before you leave our store. 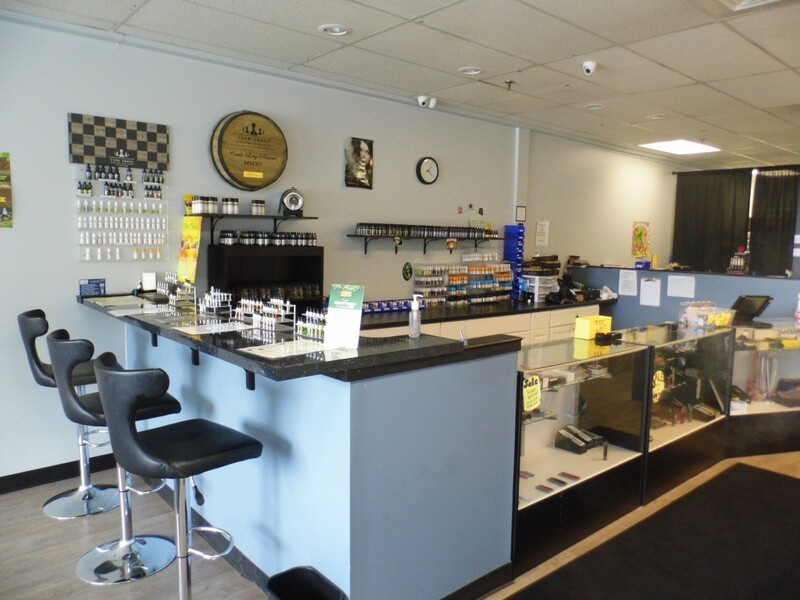 Smooth Vaporz is always here to help you with any questions you might have as a new vapor, and all locations are open seven days a week for your convenience. Vaping is an alternative to smoking traditional cigarettes. E-juice or E-liquid is what your electronic cigarette heats to produce vapor. E-liquid is a water based substance with primary ingredients that include Propylene Glycol (PG), Vegetable Glycerine (VG), flavoring, and if the customer desires - nicotine. Smooth Vaporz offers the highest quality e - liquid, all manufactured in laboratory style locations that adhere to the highest level of cleanliness and quality in the industry and are made with the finest ingredients available. Comparatively, traditional cigarettes are lit and the user is inhaling smoke that contains tobacco, tar, carcinogens, and 1000s of other poisons and unknown additives. Cigarettes have been proven to cause cancer, emphysema, COPD, and numerous other health hazards that can lead to death. So when you vape you are inhaling a water based vapor with food and pharmaceutical grade ingredients as opposed to smoke that contains hazardous and deadly ingredients. As we described above, a smoker that switches to vaping can save $1,000s a year!! Once an individual purchases an electronic cigarette and begins vaping the savings really start. As mentioned above, a 15 mL bottle of Smooth Vaporz E-liquid is the equivalent of a carton, that’s right, a carton of puffs on traditional cigarettes!! Imagine not having to buy cigarettes on a daily or weekly basis, and keeping that money in your bank account. The more you smoke - the more you can save. This is what makes is a far cheaper alternative to smoking. What are the potential dangers and warnings associated with the use of electronic cigarettes or vapor products? Do not use if you have existing health problems. Do not charge batteries unless are specifically labeled as "rechargeable". Do not install tanks on mechanical mods, they might explode. Some of the side effects of nicotine may include irregular heartbeat, changes in blood pressure, inflammation of blood vessels, chest pain, and depression, shortness of breath, sweating, dizziness, dry mouth, throat irritation, rash, swelling, nose bleed, diarrhea, headache, and dry mouth. Keep away from skin, eyes, mouth, and any other area of the body. In the event that you become in contact with nicotine, wash the affected area with soap and water.